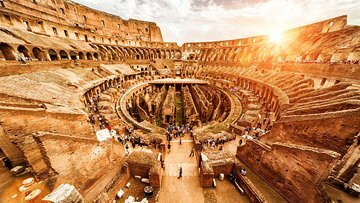 See the Colosseum with a skip-the-line ticket on an early morning, hour-long tour. Perfect if you are short on time, the experience showcases the highlights of the ancient Roman amphitheater with fun facts about the gladiator battles of bygone days. If you have a little more time free and want to learn more about Ancient Rome, upgrade to include an extra 1.5-hour tour of nearby Palatine Hill and the Roman Forum. Make your way to the meeting point by the Colosseo metro station at 8:15am in time for your 8:45am tour. With your group together, you’ll head inside the Colosseum itself. Your skip-the-line ticket allows you to bypass the general entrance line for fast-track entry to one of Rome’s most popular sites. As tales of gory gladiator battles ring in your ears, you’ll explore the first tier of the historical amphitheater from where the senators, emperors, and other important Romans would have cheered. Stroll around the arena as you learn about the trapdoors and other mechanisms used during the games. Hear about mock sea battles, and the wild animals that were sent out onto the floor to add even more danger to the games. Then, continue up to the second tier to soak up views over the arena floor and outside the stadium, over the rooftops of Rome. After an hour, your tour ends by the Colosseum’s official book shop. If you have more time free, upgrade to include an extra tour of Palatine Hill and the Roman Forum. The 1.5-hour add-on gives you a more in-depth look at life in Ancient Rome. Having used Viator for numerous tours over the last 5 years. I wish to express my disappointment with tour 20905P44. Despite its title, the tour was NOT Early morning. We arrived promptly at 8:15 as requested. The guide then stood in front of the Colosseum talking and talking not necessarily about the history but just talking until after 10:30. We and our grandchildren were bored, and learned almost nothing from the long wait. It was supposed to be a small group, and when we asked, we were told 8-10 people, but as more and more people were sent to our group while we waited outside, we were 25-30 people. There was no useful personal interaction. The 'Skip the Line' line was very long, and we had to wait for the tour group to buy tickets rather than having them pre-purchased. We chose to leave the tour and quickly buy separate tickets for Palatine Hill rather than wait the next hour for the guide and group to get there. I would not recommend this particular tour group to any sophisticated travelerI know.